This month has gone by so fast but I'm so excited that it's over as I can finally start watching Christmas films without feeling like an absolute idiot. I've been looking forward to writing this post to share with you the things I've been loving this month as I've really loved the following things. 1. The Organic Surge super-intensive daily moisturiser for dry skin has been my go-to moisturiser this month. Earlier in the month I had a horrible break out on my forehead and my t-zone was ridiculously oily so I used lots of intensive face masks and other products to dry out my skin but then I was left with peeling skin (not cool) This moisturiser works wonders on the skin and has nourished my skin, leaving it balanced and soft. 2. L'Oreal Waterproof Telescopic Mascara is "da bomb" I've used the normal not waterproof version of this mascara before and loved it so much I brought the waterproof version. 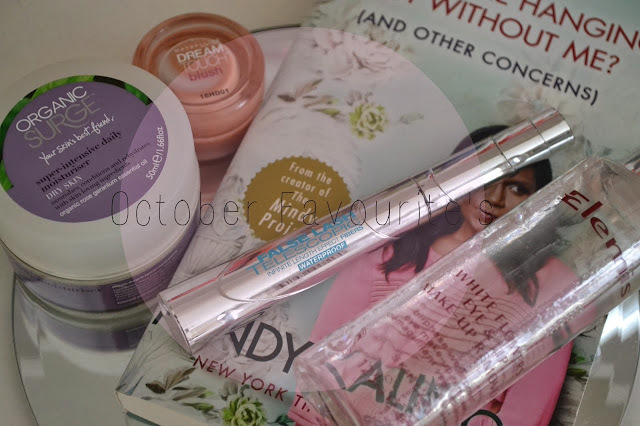 I tend to wear waterproof mascara if I need my make-up to last a long time but it's a pain to get off however my other October favourite (make-up remover from Elemis) has definitely helped out with this. Also for some reason this month I've been far too over emotional, I literally cry at adverts and films or anything that moves me but this mascara has ensured I haven't been left panda eyed! 3. I've had Maybelline Dream Touch Blush for quite a while now and never really used it but I've worked into my daily routine now and I love it, I wash it across the cheeks and up the cheekbone and then apply a bit of my Bourjous blush in 'Rose' on the apples of my cheeks. It's not too much of a strong blush so it's not overpowering. I've found that the two actually work so nicely together, I might do a post on this combo next week! 4. As I said I've been wearing waterproof makeup a lot this month so I've turned to my Elemis Eye & Lips Make-up Remover. This is oil based and makes the removal of eye makeup so much easier. I like to use this before I cleanse as it is rather oily and I hate the feeling of oily things on my face so I make sure I wash it off quickly. It's really gentle on the eyes which I love as other oil-based makeup removers always irritate my eyes and leave them blurry. 5. One of my favourite shows to watch is 'The Mindy Project', if you haven't seen it then go watch it, you won't be disappointed. My October favourite book 'Is everyone hanging out with me?' and is written by the fabulous Mindy Kaling, the creator and main star of the show. Mindy is hilarious and witty so this book has been a joy to read. I've still got a little bit left to go but am taking my time as I don't want it to end!